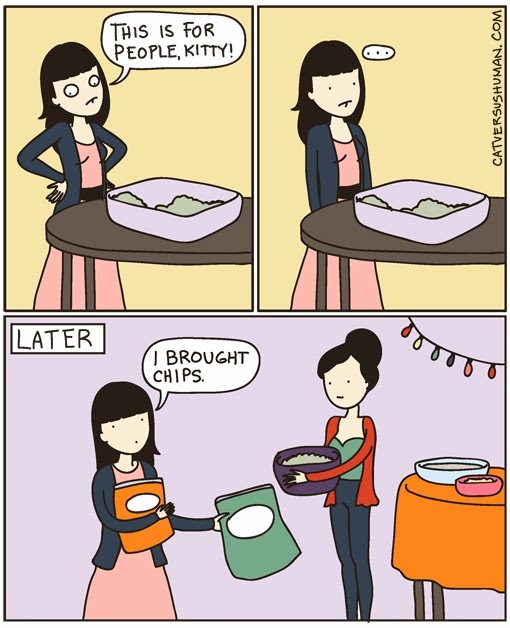 My excuse for bringing chips at parties. Nah, I have to say that this would never happen at my house with my four moggies, Perhaps you need to keep a better eye on your kitchen area? My cats are not allowed on my cooking surfaces, it's just unhygienic! And I've trained them to keep of my kitchen surfaces, not that I don't mind them licking or eating off my plates and bowls etc, once I have finished with them, but to have them walking on my food preparation areas is just not hygienic, especially if they've just used their litter tray or something, ewww! Are you dumb? Or you don't get what is mean to be just funny??? sorry, nobody cares for self-promoting comments on the internet, especially when it's in comparison to a web-comic situation. that's just sad. Let's say this is based on a real life scenario, which it probably is. 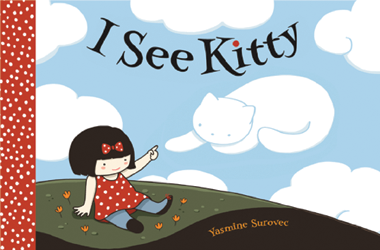 Do you expect people to have mind control over their cats or to be able to predict their every move? The cats could very well know that they are not allowed on the counter but if you're not around and given the chance, they will do what they want to do regardless of how well you have them trained, how hygienic you are or how much you do or do not care. 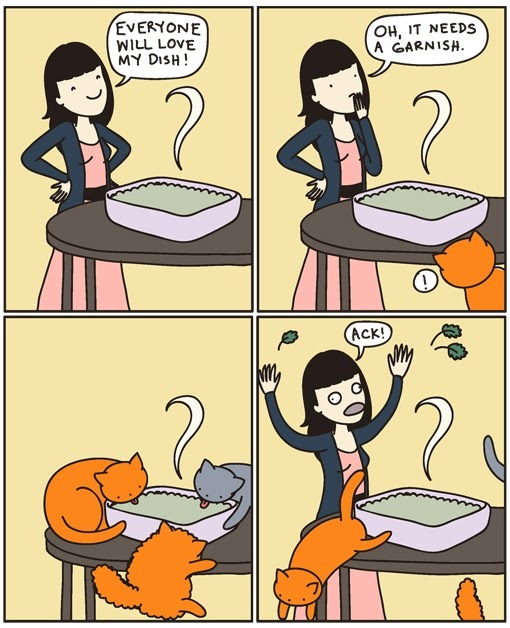 This is just a comic and a great one that many people with kitty friends can relate to. Oh God... It's a comic...!!! 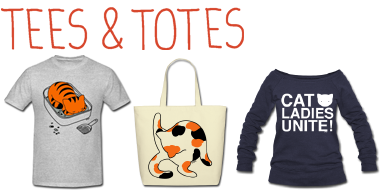 you should go brag in some we trained our pets well group. My 2 are trained very well but are not to be ultimately trusted. I shall assume from you saying you have 4 you are slightly irresponsible and getting close to a number of cats where they can't all be loved enough.... or given enough time to be trained well enough to listen like a dog... Also the fact you called them your moggies and insinuated they are perfect says to me you are nuts and so I'd imagine you overlook A LOT of behavioral problems so your little angels can remain perfect. I guarantee you have to say no multiple times on a daily basis. On a note back out of la la land the comic and point of me being here was totally worth it. I really like the drawing style. Good job on training your pets well. :) Don't let other people's comments get you down, I'm sure your comment was meant to be helpful and people misinterpreted it. hahaha Claire Kelly figured out how to use the 'anonymous' option to defend herself. it's a comic, get over it! I bet your cats wak all over your counters when you're not around. Okay, seriously? YOU LIVE WITH FOUR CATS. Unhygienic was thrown out the window a LOOOOONG time ago. Cats do have minds of there own and don't really care what humans think. Mine are trained to not go on surfaces as well, but that doesn't mean they don't to it when I'm not around. haha yeah.. for the person saying their cats would never do that.. my,now passed on, cat NEVER went on the counters in our presence, for like 16 years (we thought ourselves pretty lucky).. but, then one day, my dad left a cooked steak on the counter and left the room for a few minutes.. came back in and found dear kitty right up next to it, licking away.. soo, don't be so sure. Ours know full well they are not supposed to be on the counters but like others they will sneak up there any chance they get. We always put open food like that on the stove, they have never jumped on it (that I know of! ), but it is not attached to a counter or they probably would. And now I have cursed myself and they are probably on the stove right now! That dish doesn't look very appetizing anyway, being all gray. But my cats eat chips, too! Ultimately,sensation is the most crucial facet of “puppy love”.Feeling allows purpose. Generally the sensation is shaped when enjoy switches into activity if it will be in an area complete of men and women who might appear annoying and you discover that simple personal that's easy and lets you know “ Hello, might you want to own meal with me today?” Emotion is choosing to state sure to merely to dismiss that very courteous individual which stuffed your belly up with goose bumps. The other day a friend came round for the first time and I warned him not to leave his glass unattended around the kittens: "It's OK. It's their apartment, not mine. I don't mind to share with them". Most heartwarming comment I've been told lately... Kind of gross, but heartwarming. I do not know how, but I managed to train my cat to not eat people food or jump up on cooking/eating surfaces. This got tested by accident with a whole salmon fillet left on a counter one day... thirty minutes later it was still untouched. I was shocked. 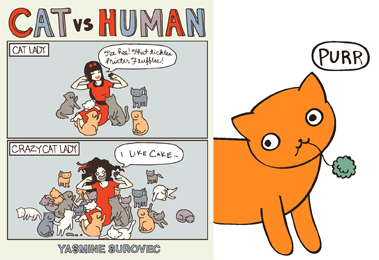 I am head over heels for cat vs human!!! Honesty, when I read the title, figured it was going to show chips as the only foolproof way to bring food without the cat hair garnish. Also, our cats, would never have done this either. They would have waited until a proper plate was fixed to lay claim with a paw prod, lick, or tail brushing/dipping. And if those tricks didn't work, nothing like a fierce head butting to knock it out your hand. Omg so funny! I know the feeling. I love your comics! I have three cats, and none of them will eat people food. I find it strange but convenient.